I'm usually pretty hesitant about rompers. I feel like you have to have a very specific body in order to pull certain ones off. I have a pretty short torso so most rompers look frumpy or just not quite right on me. After reading a post at B Loved Boston I decided to go on the hunt for a romper that would fit my body type. I found this romper at Sophie & Trey (of course!) and decided to give it a shot. Since the romper has more of a flowy feel I felt I was able to pull it off even with my short torso. To separate it a bit I decided to pair it with a gold plated belt so it looked less like a romper and more like shorts and a top. One of my favorite parts of this romper (which I completely failed to take pictures of!) is the back. The back drapes down low and has a Grecian feel to it. My other favorite part? It has pockets!! 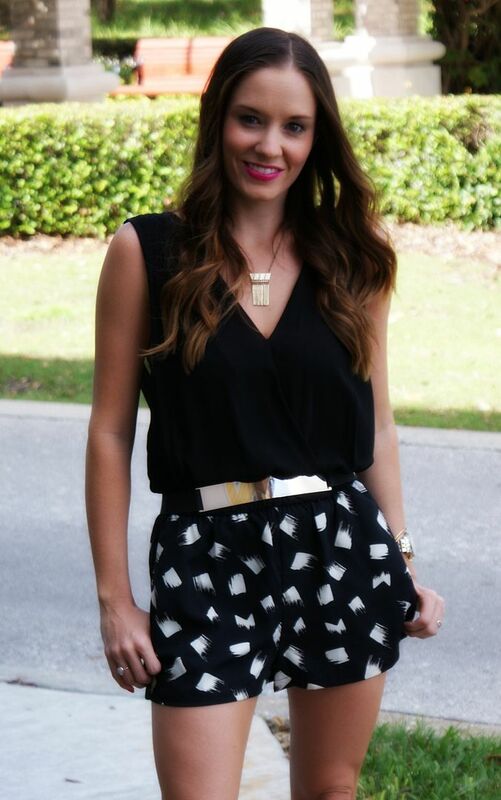 We all know how much I love pockets ;) How do you feel about the romper trend? Love this romper on you!! The print on the shorts is so cute! You know my obsession with rompers so you know I'm totally digging this look!! You look gorgeous! I absolutely love this look, the romper is so fun and summery and the heels definitely glam it up. Super chic. I love rompers...till I have to go to the bathroom....TMI? I was on a such a hunt last season for thin gold belts like this one! I think Pinterest inspired me ;-) Love how you paired it with this one! I have a Cynthia Steffe romper I got at Loehmanns two years ago and I haven't taken the tags off. Definitely this season for sure! OMG I feel the exact same way Amanda! I totally wanted to write about that but thought people would think I was weird! It's so awkward going to the bathroom in rompers! I can't wait to see your Cynthia Steffe romper!! This romper looks awesome on you, doll! I love a good romper when the weather warms up (now if only Kansas City will fully thaw out!). Okay 1. This romper is so cute and I love the detailing on it! 2. You've got some killer legs! You look stunning!! love it! if only i had your legs-for-days to pull it off! You look hot! Great legs you got.